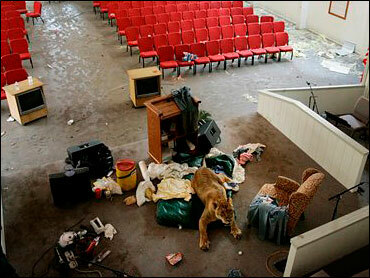 Many years from now, a small group of Hurricane Ike survivors will probably still be telling the story of how, on the night the storm flattened their island, they took sanctuary in a church - with a lion. The full-grown lion was from a local zoo, and the owner was trying to drive to safety with the animal when he saw cars and trucks stranded in the rising floodwaters. He knew he and the lion were in trouble. He headed for the church and was met by a group of residents who helped the lion wade inside, where they locked it in a sanctuary as the storm raged. The water crept up to their waists, and two-by-fours came floating through broken windows. But the lion was as calm as a kitten. When daylight came, everyone was still alive. "They worked pretty well together, actually," said the lion's owner, Michael Ray Kujawa. "When you have to swim, the lion doesn't care about eating nobody." Amid the destruction in places like Bolivar Peninsula and Galveston, where row upon row of houses were scoured from the landscape, seemingly impossible tales of survival have begun emerge. Whether through faith or fate, luck or resourcefulness, dozens of people who stayed behind made it out alive, and have harrowing stories to prove it. As of Tuesday, the official death toll from Ike stood at 48. Only 17 were in Texas - and many of those were people killed by fires or generator fumes after the storm had passed. However, authorities held out the possibility that some victims were washed out to sea. Among those who made it out alive was Kathi Norton, who put on a life jacket as the storm closed in on High Island, on the Bolivar Peninsula. She and her husband, Paul, knew the dangers of staying, and put their important documents, credit cards, money and cell phones into a plastic bag, and held on tight. All too quickly, the floodwaters rose and the house started to break apart. Through the gaps, they saw refrigerators, lawn mowers and hot tubs floating past. The deck broke away next. Then the roof started to buckle. "The whole floor was just opened out," he said. Norton grabbed his wife and headed for an outdoor staircase, escaping in time only because a flagpole kept the house from crashing down for a few precious seconds. "I look up, the house is coming on us," he said. For hours, they sloshed around in 4-foot waves before finding themselves perched in a tree. They finally made their way onto someone's motor home, which then started to sink. They were able to cling to rafters of a nearby structure and hang on until daybreak. "We had to grab that staircase and float wherever it took us," the 68-year-old retiree said. Willis Turner decided to ride it out on his wooden boat next to his house on Crystal Beach, also on Bolivar Peninsula, but it nearly capsized and he was saved by a rope his wife tossed to him. The two held on inside a home that she said "vibrated like a guitar string." "It was like an atomic bomb going off. Right after the eye passed, whole houses came by us at 30 miles an hour - WHOLE HOUSES! - just floating right past," Turner said. "It was unreal. Unreal." Turner and his wife awoke the next day to an island they no longer recognized. The first four rows of houses on the beach were washed into the sea. There were no more restaurants, no more gas stations, no more grocery stores. The neighborhood was gone. In Galveston, Charlene Warner, 52, weathered the storm with her landlord and a neighbor in the apartment above her own. "It felt like an earthquake - the rumbling and the rocking of the building," she said, smoking outside a shelter in San Antonio. "Everyone was praying." "It was so terrible. All I could say was, 'Lord, please don't kill me. Forgive me for what I done,"' Warner said, as a tear rolled down her cheek. After the storm, she and neighbors waited for rescue, but no one came. The water receded, leaving a layer of muck filled with snakes. But with no water, no electricity and a shrinking supply of food, Warner decided to go for help, sliding her way across the goo a block and a half to the fire station. Firefighters took her and neighbors to a spot where they could get on an evacuation bus. She arrived at a shelter in San Antonio with her purse stuffed full of personal documents and cigarettes, and one spare outfit that she washed and drip-dried on a railing Tuesday. "I lost everything. What you see with me is all I have," she said. "I never seen anything like that in my life. I'll never ride out another storm." Cheryl Stanley said she and her husband, Tom, wanted to evacuate their Galveston apartment before the hurricane hit but couldn't. Their son, Casey, has cerebral palsy, and the three live on the third floor. When they tried to leave, the elevators were turned off, and they couldn't carry Casey down the stairs. "It was horrible," Cheryl said. "The building was shaking all night." A few hours into the storm, Casey said he didn't feel safe in the bedroom, so they moved him to the living room. About three hours later, the ceiling in his bedroom collapsed. "Thank God, we got Casey out of there," his mother said. After the storm passed, paramedics carried Casey downstairs. And neighbors carried the wheelchair. At the Baptist church on Bolivar Island where the lion spent the night, Richard Jones, a shrimper, said he wasn't afraid of the beast. "That little old fella is just as tame as a kitten," Jones said. After the storm passed, the lion's caretakers fed it pork roast to keep it happy. National Guardsmen dropping off food and water lined up Tuesday in the choir loft to get a glimpse of the lion, and the soldiers jumped back when the lion looked up from its perch on the altar and snarled. Jones said he hadn't stepped foot in a church in the 40 years he has lived on this spit of land. And he wasn't ready to call his survival divine intervention. "I drink beer and chase women, gamble, cuss," Jones said. "You can't call that religion. I'm either too good, the devil won't have me, or I'm so bad the Good Lord won't take me. That's a good toss-up."